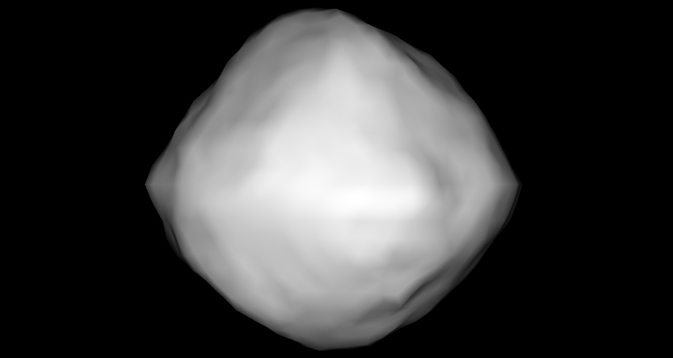 This model of asteroid 1999 RQ36 was constructed using data from the Arecibo Observatory in Puerto Rico (Credits: NASA/NSF/Cornell/Nolan). A scientist at NASA’s Jet Propulsion Laboratory in Pasadena, Calif., has accurately determined the mass of a nearby asteroid from millions of miles away. The celestial equivalent of “guess your weight” was achieved by Steve Chesley of JPL’s Near-Earth Object Program Office by utilizing data from three NASA assets – the Goldstone Solar System Radar in the California desert, the orbiting Spitzer Space telescope, and the NASA-sponsored Arecibo Observatory in Puerto Rico. For Chesley to define the asteroid’s mass, he first needed to understand its orbit and everything that could affect that orbit — including neighboring celestial bodies and any propulsive force (however minute) the asteroid could generate. Incorporating extraordinarily precise observations collected by astronomer Michael Nolan at Arecibo Observatory in September 2011, Arecibo and Goldstone radar observations made in 1999 and 2005, and the gravitational effects of the sun, moon, planets and other asteroids, Chesley was able to calculate how far the asteroid deviated from its anticipated orbit. He found that 1999 RQ36 had deviated from the mathematical model by about 100 miles (160 kilometers) in the past 12 years. The only logical explanation for this orbital change was that the space rock itself was generating a minute propulsive force known in space rock circles as the Yarkovsky effect. The Yarkovsky effect is named for the 19th-century Russian engineer who first proposed the idea that a small, rocky space object would, over long periods of time, be noticeably nudged in its orbit by the slight push created when it absorbs sunlight and then re-emits that energy as heat. The effect is hard to measure because it’s so infinitesimally small. The final piece to the puzzle was provided by Josh Emery of the University of Tennessee, Knoxville, who used NASA’s Spitzer Space Telescope in 2007 to study the space rock’s thermal characteristics. Emery’s measurements of the infrared emissions from 1999 RQ36 allowed him to derive the object’s temperatures. From there he was able to determine the degree to which the asteroid is covered by an insulating blanket of fine material, which is a key factor for the Yarkovsky effect. With the asteroid’s orbit, size, thermal properties and propulsive force (Yarkovsky effect) understood, Chesley was able to perform the space rock scientist equivalent of solving for “X” and calculate its bulk density. Asteroid 1999 RQ36 is of particular interest to NASA as it is the target of the agency’s OSIRIS-REx (Origins, Spectral Interpretation, Resource Identification, Security, Regolith Explorer) mission. Scheduled for launch in 2016, ORIRIS-Rex will visit 1999 RQ36, collect samples from the asteroid and return them to Earth. NASA detects, tracks and characterizes asteroids and comets passing relatively close to Earth using both ground- and space-based telescopes. The Near-Earth Object Observations Program, commonly called “Spaceguard,” discovers these objects, characterizes a subset of them, and establishes their orbits to determine if any could be potentially hazardous to our planet. JPL manages the Near-Earth Object Program Office for NASA’s Science Mission Directorate in Washington. JPL is a division of the California Institute of Technology in Pasadena. JPL also manages the Spitzer Space Telescope and Goldstone Solar System Radar.